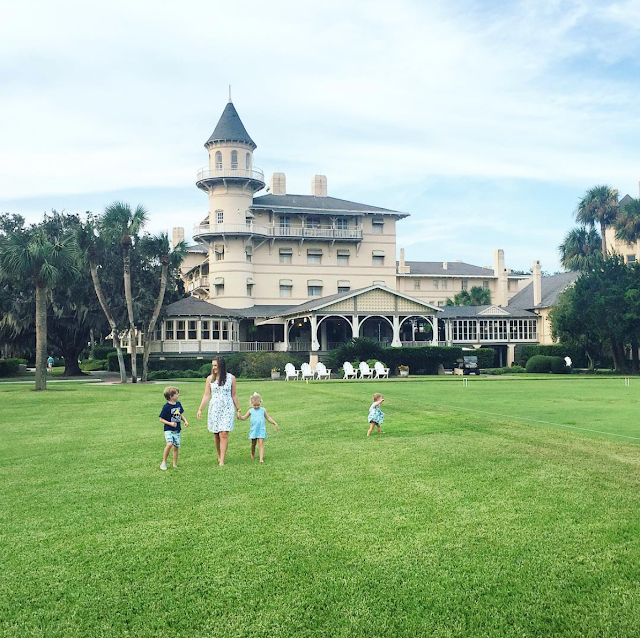 This week I've been chatting about our Fall Break vacation to Jekyll Island. Recapping has given me the beach bug, and if I could whisk my family away right back to this beautiful island, I would in a heart beat! Today I am concluding the last part of our vacation. And while we did our fare share of exploring as the week went on we were in full relaxation mode. Exactly the way a vacation should be! This day we had a few fun adventures planned for the kids. So we grabbed another quick breakfast, and then made our way to the beach. Cute was so excited to test out his frisbee he received at dinner the night before. He practiced with Mr. Cute for a full hour and became really good at it. The kids played on the beach for a few hours and then the boys headed out for an adventure of their own. The girls and I held down the tropical fort and not a one of us was complaining. While we were having heart attacks on the beach, the boys were taking in a little fishing at the Jekyll Fishing Center. Originally they had planned to do an off shore fishing trip, but the managers of the center informed them it would have been a waste of money. After the hurricane blew through, fishing was a little off, and for a few weeks they didn't think it would be suitable for fishing conditions. So they rented poles and fished off the pier. The had just as good a time, and even caught a fish or two (I can't seem to find the pictures! I only have 6,435 photos from this trip, but will add it as soon as I locate it for all you fishing connoisseurs.). After we met back up, we headed to The Georgia Sea Turtle Center. This came highly recommended to us from multiple sources, so we couldn't wait to check it out! During the first part of our stay, we learned the sea turtles had been evacuated to Chattanooga. They had been given the all clear, and on the afternoon we visited the center they were scheduled to come back. There was lots of excitement around the Center. Right off the bat our children loved it. The staff member who greeted us informed us that the turtles weren't able to be seen just yet, but that we could still interact with all the exhibits and hopefully see the turtles by closing time. She handed us a paper that let each one of us pretend to be sea turtles. Throughout the museum we can visit different stations with choices, and at the end you see what kind of sea turtle you would be. It was pretty interesting the different ways sea turtles become adults (and what can happen to them along the way). The museum itself isn't an overly large space, but it was packed with tons of great information and fun interactive exhibits. The kids had a blast checking out each station, and learned so much in such a short amount of time. Even Mr. Cute and I learned a ton of new information, and were highly impressed with how well the center was set up for children of all ages. The anticipation of seeing the sea turtles arrive was exciting. We kept seeing tons of movement in the examining rooms, but sadly never saw the turtles before closing. L.C. and I even snuck back in while everyone was purchasing souvenirs just to check one last time. She was in awe of everything happening, regardless if she saw a sea turtle or now. She had so many questions and declared that we need to come back soon to make sure everyone was okay. We most definitely need to do that! It was such a neat place to explore and I know our kids would love to return and check everything out again. After we wrapped up at The Sea Turtle Center we made our way to dinner. We decided to check out another part of the island and stumbled upon Zachary's Riverhouse. This was located right on the harbor, and had such an amazing selection of southern style seafoods. I loved the atmosphere right on the water, and the decor was so much fun. I wanted to figure out how to get that lighting fixture back home with me. It was made out of what looked like a large piece of driftwood. Coastal southern style is my jam. After filling ourselves with some yummy food, we took a little walk around the property and along the pier. The views were stunning. A nice resident of one of the yachts told our kids to watch out for the alligator that liked to swim in the waters here. The kids were all sorts of into this and did not want to leave. Fortunately, no alligator interactions occurred. We still had a little adventure in us, and I suggested we check out the infamous Driftwood Beach before we headed back to the hotel. This little spot was mentioned to us over and over again as one of the "must sees" of the island. Sadly, though, it was also one of the ones hit hardest when hurricane Irma blew through. The majority of the driftwood had been washed out to see. The beautiful trees had been ripped up, and the dunes, sidewalks, and wooden stair paths are now nothing but remnants. Aside from a stray tree here or there, this was the only spot we truly saw the destruction that Irma caused in this area. A testament to both the power of the storm as well as the amazing recovery effort by the island. This was our last day on the island before heading to our property in South Georgia and then onto home and back to reality. We wanted to soak up as much of the sun and beach as possible. We made our way back to our favorite beach spot we had found, and not shockingly we had the area all to ourselves once again. We stayed for hours and just simply enjoyed the day. The girls made sure to have sand on every single part of their body. The boys worked on a mad game of frisbee. I sat down in my beach chair for the fourth time ever. And read a book! After we beached, we made our way to the pool one last time too. One thing is for sure, I have three little fishes on my hands. Again, they get that from their mama. For lunch we headed to The Wharf. We had been eyeing this since we arrived, but it was closed the first few days to clean up some things from the hurricane. It's been a fixture on the island from the beginning, but The Wharf restaurant itself just opened a few days before the hurricane blew threw. I am so glad the hurricane spared this little gem because my tastebuds would have been missing out on a culinary experience. Okay, that might be a tad dramatic, but it was really really good. The homemade biscuits with honey butter, the mac and cheese, the fried chicken... I mean clearly I was concerned about fitting into my swimsuit after this trip. But how could a southern girl resist homemade biscuits?? Mr. Cute went the healthier, yet oh so delicious route. After we finished lunch, we decided to burn off a few calories by checking out some of the historic homes. Homes is a loose term as these are more like mansions. I'd move into any of them. Even the servants homes. I'm not picky. For our last night on the island we decided to stay local again for dinner. I was so excited to break out this little dress one more time before the summer officially ended. The kids had been dying all week to play croquet. Finally the courts were open and we let them give it a try. Not sure they got the concept, but it was fun to watch. After everyone worked up an appetite, we headed to our dinner spot. That's right...The Wharf. For lunch and dinner. It was that good. And convenient since it was only steps away from our hotel. B.C. remembered all that yummy, and couldn't contain herself when she saw a big plate of biscuits walking by and realized they weren't for her. So I took her hangry party outside, and a lovely person heard me trying to calm her down and gave her a bag of chips. Our food arrived, and we made sure to order something different than what we had for lunch. It was still just as yummy. Even down to the dessert we didn't share with the kids. So so good. We absolutely LOVED our time on Jekyll Island, and we know we will be back very very soon.